In 2008, I was at the top of my academic game. I was completing my Ph.D. from a very good program (in only 4 years, which is quite an achievement! ), had gotten a number of articles into competitive publications and was the apple of my advisor’s eye. I was a fantastic student, a quick thinker, and very efficient at producing high-quality and creative work. There was only one problem. I hated it. I dreaded going into work every morning. I ended each day with a headache. I had stomach ulcers and frequently came down with colds. Not only was I unhappy, but the stress was physically ruining me. I couldn’t imagine living the rest of my life like that. I couldn’t imagine the next step: working long days in order to become a tenured professor. But, at the same time, leaving seemed unthinkable. Was I really prepared to ‘throw away’ all those years of education? What in the world would I do? So, I did it! I announced to my advisor, friends, and family that I was leaving the academic world to make stuffed animals. It was much more difficult to say aloud than I had thought. I was met with such ridicule. One professor told me that I was making “the stupidest mistake of my life”. Others thought I had just gone crazy. Leaving academia, they said, was fine . . . but shouldn’t I do something at least related? Thankfully, my boyfriend (now husband) was amazingly supportive – even though he was as surprised (and skeptical) about my passion for stuffed animals as everyone else. That summer, I purchased a website and poured my heart and soul into making stuffed animals. I got a job at a yarn store in town so that I could earn some income until my business took off. It’s now three years later and I’ve written 2 books about stuffed animal-making, and I am delighted that my stuffed animal-designing is my full-time job. I’m happier than I’ve ever been in my life. Every morning, I wake up and am thrilled about what I do. 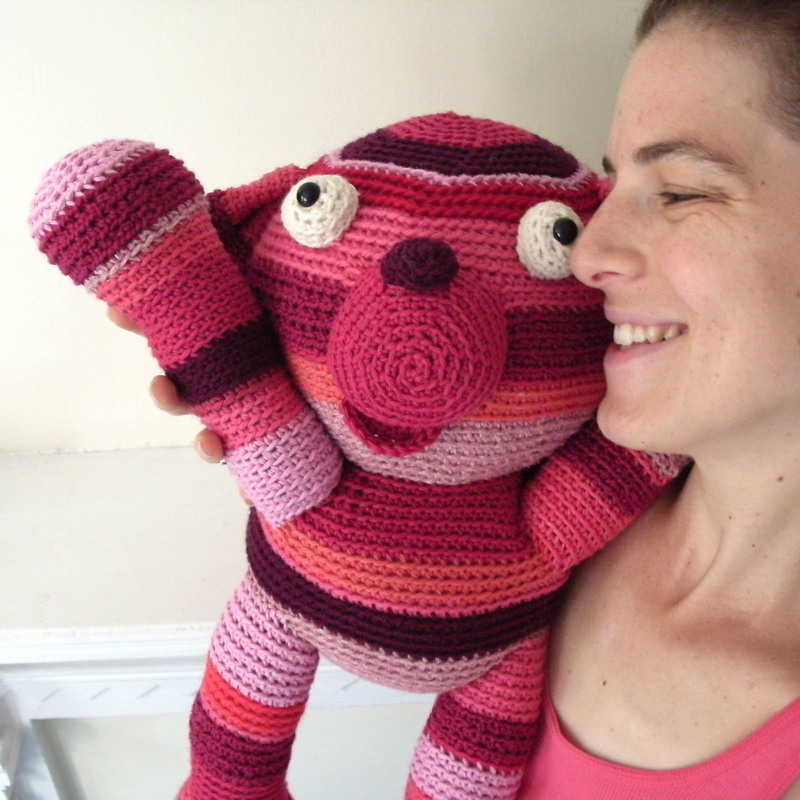 I love making stuffed animals, I love sharing them with my customers, and I love writing on my blog (talking about my creative process). I occasionally daydream about what I’d like to do next, and although I may come up with a variety of ideas . . . they’re all variations of what I do now. I can see myself doing this job (or the natural progression of it) for the rest of my life. I’ve also achieved that sought-after work/life balance. Because run my own company, I make my own hours, and I am careful to leave time in my day to have an actual life! I volunteer as a studio manager at my local yoga studio (which has the benefit of free yoga classes! ), and I go running multiple times a week. I also enjoy gardening, baking and knitting. And, if children are in my future, I’m confident that I can arrange my schedule/minimize my work hours so that I can live a life of spending quality time with my kids while still pursuing a career that I adore. It’s still an ongoing struggle not to get caught up in the ‘rat-race’: there’s always pressure to make more money, be more famous, and get more business. But I know that part of the reason I love my job (aside from it being so fun!) is that it’s part of a balanced life, and I don’t dare alter that balance by over-booking myself. I make sure that I am off of work every day by 6, and spend the evenings being invested in my life . . . not drowning in work. I was very lucky — I began my new career at a time in my life (with low expenses and no children) when I could dive right into my new business whole-heartedly. Not everyone has that luxury. But almost everyone has a few hours each week to spare to begin building their fantasy career. It may not turn into a full-time job for a few years, but you can start to build your dreams this week. You won’t regret it! You can see more of Stacey’s fantastic creations, and learn a little more about her, at her website, www.freshstitches.com, and her blog, www.freshstitches.com/wordpress. Stacey, this is a very inspiring story. Thank you for sharing it. I was smiling the entire time I was reading it. It’s empowering to hear that people out there, like you, have the courage to leave a traditional/glamorous/”right”/pre-determined/etc. career path in order to follow your dreams. I am still in the search for the time when I wake up…eager to do what I love. You’re a hero among us who are still searching. By the way, love your website and stuffed animals. Best of luck!